Cassia differs from cinnamon in strength and quality. The bark and quills are darker, coarser, and woodier, and the bark is reddish brown. Cassia is sweet and spicy like cinnamon but more pungent. Its buds are like cloves but with a slight aroma. Nowadays, true cinnamon and cassia are colloquially referred to as cinnamon, and most cinnamon sold in the market today is cassia. It is exported across the globe from Indonesia, Vietnam, China, and India. The main species yielding cassia are Cinnamomum burmannii, Cinnamomum aromaticum syn, Cinnamomum loureirei, and Cinnamomum cassia. A limited amount of cassia is also produced in India from Cinnamomum tamala. Cassia is part of the Chinese five spice powder with Sichuan pepper, cloves, fennel, star anise, and cloves. A popular sauce in Chinese food, known as the “master sauce,” contains five spice powder with liquorice. Similarly, cassia is an ingredient in the Indian masala that is used in nearly every Indian curry. Cassia is also used in baked goods, drinks, and cuisine across the globe. There are references to cassia in the Ebers papyrus. Rufus of Ephesus (c. 50 AD) mentions cassia as one the ingredients in the Egyptian incense Kyphi, but other documented recipes by scholars such as Dioscorides mention cardamom. Pliny mentions the use of cassia as a flavoring agent in wines (nat. 14, 107f). The 3rd-century BC Greek scholar Theophrastus described megaleion, a poultice of burnt resin, cassia, cinnamon, oil of balanos, and myrrh, that helped relieve wound inflammation. Sappho was the first Greek to reference cassia in a poem (c. 7th century BC). The Jews used cassia as incense in the First and Second Temples of Jerusalem. It was one of the 11 ingredients in the concentrated Jewish incense, Ketoret, which was used to prepare the Jewish temple for worship. The Bible mentions cassia several times as an ingredient of the Holy Anointing Oil. 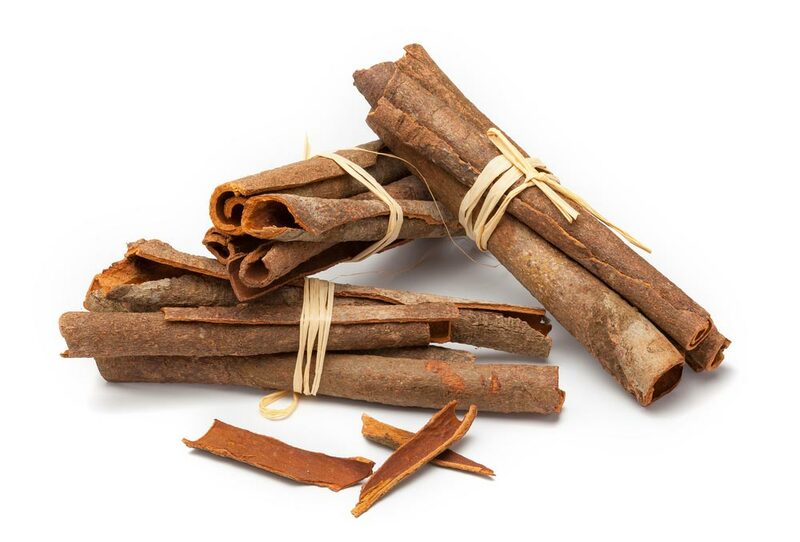 Ezekiel 27:19 and Psalm 45:8 reveal the existence of trade in spices, including cassia and cinnamon, which were used in unguents to perfume hair and garments in Greek and Roman times. When the Romans acquired global power (c. 200 BC), the Mediterranean ports began receiving large quantities of imported spices and other products from India, Malacca (Maluku) Islands, and the Arabian Peninsula. Goods traveled from the ports of Alexandria and Tyre to Africa, Europe, and Asia. Literature surveys indicate that the major sources of cassia were Indonesia and India. The majority of trade was by boat via the Indian Ocean and the Red Sea, although the Silk Route from China was also used to trade with Mesopotamia. In China, cassia is called kwei and is referenced in Traditional Chinese Medicine dating back to Sheng Nung (c. 2700 BC). The species is mentioned extensively in Ayurveda. It is also an important culinary spice in India and eastern Asian. Cassia is also used extensively in the cosmetic industry. In grated and essential oil forms, the product is mixed with olive oil or petroleum jelly to produce skin treatment products. Like in most traditional medicine practices, cassia is often administered in combination with other herbs. Thus, conclusive evidence of its medicinal impact is difficult to obtain.